As a result of increasing instances of violence across the world, several countries have adopted initiatives to modernize their police force. Moreover, measures undertaken by various countries to counter illegal mining, deforestation and drug trafficking has also impacted the growth of the market positively. Considering these factors and also due to the rise in crime rates across most countries, the impact of this driver is currently high and is expected to remain high throughout the forecast period. By type, the market is segmented into two different classes of weapons; small arms and light weapons. Small arms refer to weapons designed solely for individual use. Small arms include pistols, rifles, handguns, shotguns, man-portable machine guns and others, whereas light weapons include arms designed to be used by a crew of two or three persons. It comprises landmines, mortars, grenade launchers, rocket launchers, Rocket Propelled Grenades (RPGs), anti tank weapons, anti aircraft weapons and others. Small arms and light weapons (SALW) are widely used in military defense, homeland security, and civil utilities among others. In terms of application, market is segmented into military, law enforcement and others which include civilian, trainers and hunters among others. The military segment was the largest segment of the Small Arms and Light Weapons (SALW) market in 2014 in terms of revenue and is expected to maintain its dominance throughout the forecast period. On the basis of geography, market has been segmented into four categories North America, Europe, Asia Pacific and Rest of the World (RoW). Europe occupied the largest share in the market in 2014 accounting for more than 30%, whereas North America was the second largest market in 2014. Some of the major players in the market are Heckler & Koch GmbH (Oberndorf am Neckar, Germany), General Dynamics Corporation (Virginia, U.S.), FN Herstal S.A. (Herstal, Belgium), Sturm, Ruger & Company, Inc. (Connecticut, U.S.), SIG SAUER GmbH & Co. (Eckernförde, Germany), Colt's Manufacturing Company LLC (Connecticut, U.S.), Carl Walther GmbH (Ulm, Germany), Lockheed Martin Corporation(Maryland, U.S.), Glock Ges. m.b.H. (Deutsch Wagram, Austria), Browning Arms Company (Utah, U.S.) and Beretta S.p.A. (Gardone Val Trompia, Italy) among others. Small arms and Light Weapons (SALW) refers to two different classes of weapons. Small arms refer to the kind of weapons designed solely for individual use whereas, light weapons includes arms designed to be used by a crew of two or three persons. The global Small Arms and Light Weapons (SALW) market has been categorized on the basis of types, application and geography. The market on the basis of type has been segmented into small arms and light weapons. The small arms segment has been further divided into six types; pistols, rifles, handguns, shotguns, man-portable machine guns and others. Similarly, the light weapons market has been divided into eight categories: landmines, mortars, grenade launchers, rocket launchers, Rocket Propelled Grenades (RPGs), anti tank weapons, anti aircraft weapons and others. In terms of application the market for Small arms and Light Weapons (SALW) has been segmented into: military, law enforcement and others. The Small Arms and Light Weapons (SALW) market has been bifurcated geographically into four regions: North America, Europe, Asia Pacific and Rest of the World (RoW). The Rest of the World has been further segmented into Middle East and Africa and South America. The market for Small Arms and Light Weapons (SALW) is primarily driven by factors such as implementation of Soldier Modernization Programs and Police Modernization Programs across various countries. For example in 2013, the national government of Philippines in an attempt to modernize its local police has announced the procurement of a total of 74,879 modern side arms and 30,253 basic rifles which will be issued to rural frontline units nationwide. Moreover, factors such as increasing instances of urban warfare coupled with increasing instances of terrorists’ attacks are also impacting the demand for Small Arms and Light Weapons (SALW) positively. The initiatives taken by various countries such as the U.S., France and Russia among others to curb terrorist organizations have further resulted in an increased demand for Small Arms and Light Weapons (SALW). In the recent past, terrorist outfits such as ISIS and Boko Haram have constantly carried out terrorist attacks across various countries. In addition, in order to counter these terrorist outfits a large number of military and law enforcement personnel’s are being deployed by the respective governments. These factors in combination are further expected to propel demand for Small Arms and Light Weapons (SALW) throughout the forecast period. Measures to restrict drug trafficking is another factor which is contributing to the growth of the Small Arms and Light Weapons (SALW) market. However, the presence of stringent firearm legislations across various countries is one of the major restraints hindering the growth of the Small Arms and Light Weapons (SALW) market. For example, in the U.K., the use of handguns is prohibited and requires special permission in the form of certificate from the police. The company profiles of the major players in the global Small Arms and Light Weapons (SALW) market across four major geographic regions namely North America, Europe, Asia Pacific (APAC), and Rest of the World (RoW) has been extensively covered under the purview of the study. Moreover, the business strategies being adopted by the major players in the market have also been included in the report. 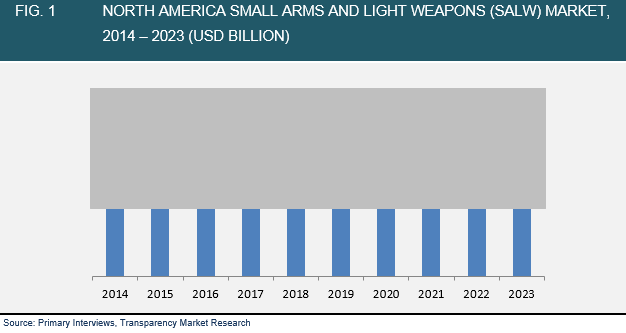 The market attractive analysis has also been provided in the report for providing a detailed insight into the global Small Arms and Light Weapons (SALW) market. The market dynamics, which includes the market drivers, restraints and opportunities, has also been included under the scope of the report. Market dynamics help to understand the current trends in the global market by providing insights of the distinctive factors that influence the growth of the specific market. Thus, this report provides an inclusive study of the global Small Arms and Light Weapons (SALW) market and also provides forecast of the market for the period from 2015-2023. Some of the major players in the market are: Heckler & Koch GmBH, General Dynamics Corporation, FN Herstal, S.A., Sturm, Ruger & Company, Inc., SIG SAUER GmbH & Co., Colt's Manufacturing Company LLC, Carl Walther GmbH, Lockheed Martin Corporation, Glock Ges. m.b.H., Browning Arms Company and Beretta S.p.A. among others.